Intending to travel to Johor Bahru by public transport via Woodlands Causeway? Below are the tips on how to get there! via Marsiling MRT. Alight at Woodlands Train Checkpoint. Same queue and routing as 856. Terminates at Woodlands Train Checkpoint. via Riverside Road, Marsiling Lane. Alight at Woodlands Train Checkpoint. Shortest route to Woodlands Train Checkpoint. Same queue and routing as 911.
via Woodlands Avenue 1. Longest route to Woodlands Train Checkpoint, not recommended. via Marsiling MRT. Direct service to Woodlands Checkpoint. Board SMRT 950 at berth 9 for direct service to Woodlands Checkpoint. Board SMRT 856, 856A, 903, 911, 912, 912B to Woodlands Train Checkpoint, and walk to Woodlands Checkpoint thereafter. This option is useful when the causeway or checkpoint is heavily jammed, as you are able to reduce some journey time by walking. The fastest alternative from Woodlands to Woodlands Train Checkpoint is 856 and 911. Bus services 903, 912 & 912B would take a longer route to Woodlands Train Checkpoint. Be mindful of which bus service you are boarding, as Intra-town bus services 911 has two different routes. For trips terminating at Woodlands Interchange, 911T will be displayed on the buses, routing will remain the same as the usual 911. Do note that SMRT 912A will ply towards Admiralty MRT, while SMRT 912B will ply towards Woodlands Train Checkpoint. One easy way to remember is: A for Admiralty, B for border. From 17 March 2019, Service 913 will be amended to loop at Marsiling MRT Station. As such, Service 913 will no longer serve Woodlands Train Checkpoint. Please also note that if you intend to alight at Woodlands Train Checkpoint, your journey will not be suspended like 950 at Woodlands Checkpoint. Boarding any SBS Transit or SMRT bus at Woodlands Checkpoint will become a transfer or New Ride* to those bus services at checkpoint. *New Ride is only applicable if your transfer allowance time has expired. Refer to the easy diagram below for illustration. Woodlands Temporary Bus Interchange Layout. All Singapore public buses accepts CEPAS Ez-Link Card and deducts distance fare as approved by the Singapore's Public Transport Council. To Woodlands Train Checkpoint: S$1.50 (for SMRT 903, 911, 912 & 912B), S$1.70 (for SMRT 856 & 856A). Please note that cash payment trips are not transferable. Proceeds directly to Woodlands Checkpoint via Woodlands Road. Will detour to Woodlands Train Checkpoint before entering Woodlands Checkpoint. Does not go into Woodlands Checkpoint, alight at Woodlands Train Checkpoint. Non-stop direct service to Woodlands Checkpoint. Board SBS Transit 160, 170, 170X and Causeway Link CW1 for direct service to Woodlands Checkpoint. Board SBS Transit 170, 170A and SMRT 178 to Woodlands Train Checkpoint, and walk to Woodlands Checkpoint thereafter. This option is useful when the causeway or checkpoint is heavily congested, as you are able to cut some journey time by walking. Please also note that if you intend to alight at Woodlands Train Checkpoint, your journey will not be suspended like 160, 170 at Woodlands Checkpoint. Boarding any SBS Transit or SMRT bus at Woodlands Checkpoint will become a transfer or New Ride* to those bus services at the checkpoint. In the event of a congestion, 160, 170, 170A, 170X, 178 & CW1 may be diverted to use Woodlands Avenue 3 and Woodlands Centre Road. Please refer to the easy diagram below for illustration. Boarding bus stops at Kranji MRT Station. Causeway Link CW1 accepts ManjaLink Card. S$1.50 by SBST 170A & SMRT 178. S$1.50 by Causeway Link CW1, S$1.70 by SBST 160, 170 or 170X. S$1.50 by Causeway Link CW1 or S$2.30 by SBST 170. Boarding Location: Queen Street Terminal. All of these buses except SBS Transit 170A goes directly to Woodlands Checkpoint. It is recommended to take CW2 or SJE from Queen Street, as these services will head straight to Woodlands Checkpoint via the Pan-Island Expressway (PIE) and Bukit Timah Expressway (BKE). SBS Transit 170 will have to stop at all bus stops along Bukit Timah Road, Upper Bukit Timah Road and Woodlands Road before heading to the checkpoint. Should there be no CW2 or SJE for a long duration, 170 will become a useful bus service to get away from the crowd. Please note that SBS Transit 170A terminates at Woodlands Train Checkpoint and does not go into Woodlands Checkpoint at all. Board 170, CW2 or SJE at Queen Street Terminal. Causeway Link CW2: S$3.00 by ManjaLink Card, or S$3.30 by Ez-Link Card. To Johor Bahru Checkpoint / Larkin Terminal: S$2.60 by SBST 170, or S$3.30 by Causeway Link CW2 or SJE. Passengers may take Transtar TS1 from Changi Airport to CIQ Johor Bahru. Alternatively, passengers may also ride on SMRT bus service 858 from Changi Airport to Woodlands. While bus service 858 provides direct connection between Changi Airport and Woodlands, it is recommended to alight at Khatib MRT and take the North-South Line to Woodlands for a faster journey. The bus journey between Khatib MRT and Woodlands Interchange typically takes around 40 to 50 minutes. Booking and payment of tickets for Transtar Cross-border bus services TS1, TS3 and TS8 can be made through Easybook. Payment of bus fare can be made on board the bus as well. Please refer to the dropdown menu below for the full list of bus services available from Singapore to Johor Bahru via Woodlands. For information on bus services to Johor Bahru via Second Link, please read Bus Services From Singapore to Johor Bahru (via Second Link). From Woodlands Checkpoint, passengers may choose to switch to other bus routes, or in the event of heavy congestion, passengers can walk to Johor Bahru Checkpoint. Passengers do not have to board back the same bus service as they have alighted from. Ez-Link Card users can continue their journey with SBS Transit bus 160, 170, 170X & SMRT 950. Manjalink users or Causeway Link ticket holders can continue their journey with any of the Causeway Link buses. For AC7, SJE, TS1, TS3 & TS8, passengers can only board back the same bus, as the ticket is not interchangeable with other bus services. Passengers walked in from Woodlands Train Checkpoint are allowed to board any of the bus services, except Singapore-Johore Express (SJE), which only allows SJE ticket holders to board only. Walking from Woodlands Checkpoint to Johor Bahru Checkpoint generally takes about 20 to 30 minutes, depending on your walking speed. Walk out to JB Sentral. 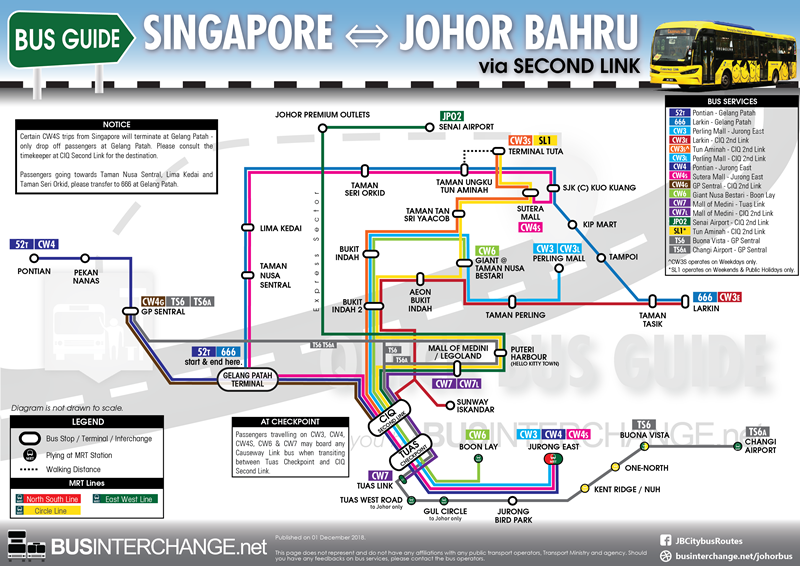 The menu below only lists the bus routes plying CIQ Johor Bahru. 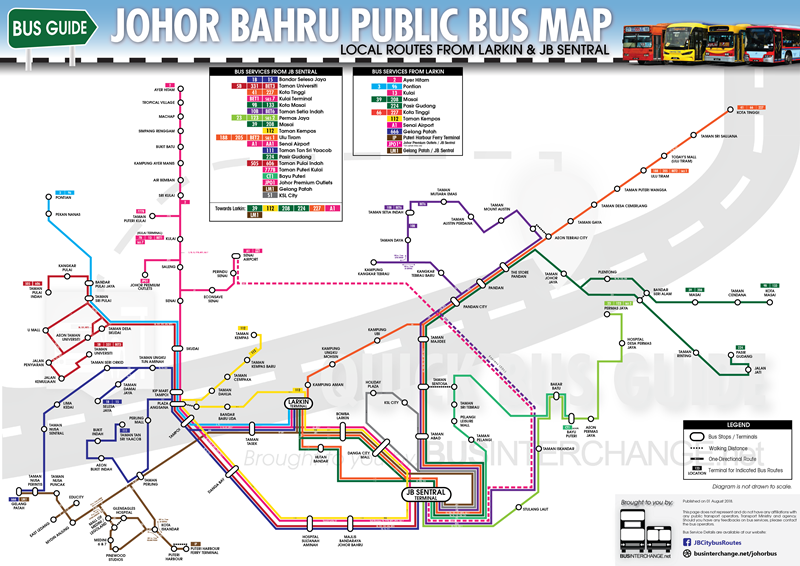 For all other local bus services, please refer to Bus Routes in Johor Bahru.